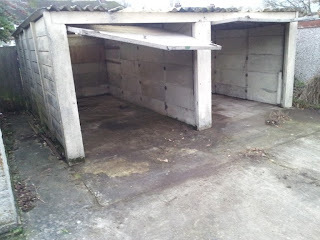 My old sectional concrete garage is looking a bit tired, and the asbestos concrete roof is crumbling and falling apart. In fact i've never once put a car in there in fear that the door might fall off and smash the car to bits. Whats the point in a garage i dont dare put my car in??? it has to go! The concrete base is in good condition, so i've been looking into getting a blockwork garage built on the existing base, with flat, felt covered roof. I've had a few quotes from local builders, but so far all seem to be astronomically high for what is essentially four single skin block walls and a plywood roof!